Most Americans consider fall their favorite season because it means cooler temperatures, a new season of football, and plenty of feasts with family and friends. Unfortunately for people trimming their fat and counting their calories, this time of year can be extra challenging, especially if you're a cookie monster at heart. With Halloween creeping up on the calendar, the temptation to make like a ghost and sneak a chocolatey treat or two into your daily diet will intensify. To keep from scaring yourself on the scale, consider these healthy and spooky Halloween treats. They're delicious alternatives to hand out to the neighborhood or to feed your kids. Before you take the kids trick or treating, make a healthy homemade pizza using whole-wheat dough and skim cheese. Roll the cheese into squares and use a ghost-shaped cookie cutter to create terrifyingly cheesy toppings. Preheat the oven to 350°F, roll the pizza dough and place it on a baking sheet. Spread tomato sauce on pizza dough and top with cuts of ghost-shaped cheese. Use black olives for the eyes and bake in the oven for 15 minutes. Just because you're watching your weight doesn't mean you have to avoid chocolate completely. After all, it's Halloween. At Bariatric Health & Wellness, we offer a chocolate marshmallow pudding that comes with chocolate chips and not the extra calories. It's the perfect dessert to eat after you've enjoyed a slice or two - no more! - of your pizza. Here's how our chocolate pudding compares to the fatty store variety. 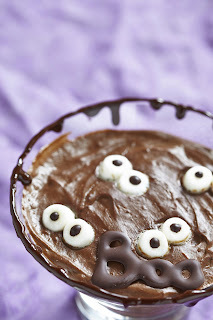 To spookify your pudding, use vanilla cookies as headstones and write 'RIP' on them. OK, so while a ghostly pizza makes for a great Halloween dinner and our pudding is a perfect choice for dessert, you'll need a healthy treat to hand out to the neighborhood kids when they come knocking on your door. Instead of handing out sugary sweets, surprise your trick or treaters with mini boxes of raisins. Although low in calories and fat, raisins are still sweet enough to satisfy a child's taste buds and trick them into thinking they're eating a candy-like treat. Remember to stay away from the raisins covered in milk chocolate, though. To spookify your raisins, wrap each box in Halloween paper. That way, your treat becomes a mystery. Do you have any healthy and spooky treat ideas for Halloween? Share your tasty tricks below in the comments.